Witchcraft has been practised for centuries and is one of the oldest religions, yet even in these modern times so much mystery still seems to surround its philosophies and practices. These courses explore Wicca, the modern term for Witchcraft in its entirety, starting with the basic major principles and teachings and layering from there. The workshops combine a mixture of talks, meditations and visualizations with the opportunity to touch and experience first-hand many of the tools used in a Wiccan ritual. The workshops also allow the students to work through and practice each section before moving on. Five 2 day workshops (Witchy 101, 102, 103, 104 & 105) have been designed to cover the fundamentals of Wicca from the essential basics through to setting up sacred space and preparing for ritual to Candle Magick, writing spells and Spell Casting. 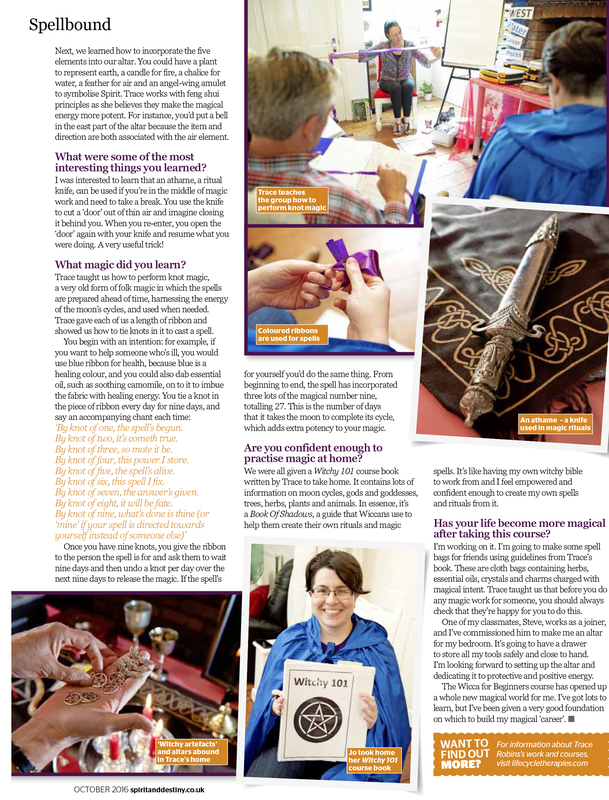 School for Witches was featured in Spirit and Destiny magazine in October of 2016 and has been providing Wiccan training to students since 2012. Over the years this course has morphed and changed and grown due to the feedback provided by students. Originally the course was 3 modules but due to popular demand, the course has now grown to 5 modules. Each module is 2 days long and is jam-packed with talks, guided meditations, practice, hands-on experience, and the opportunity to touch and use many Wiccan tools. The modules are titled Witchy 101, Witchy 102, Witchy 103, Witchy 104 and Witchy 105. 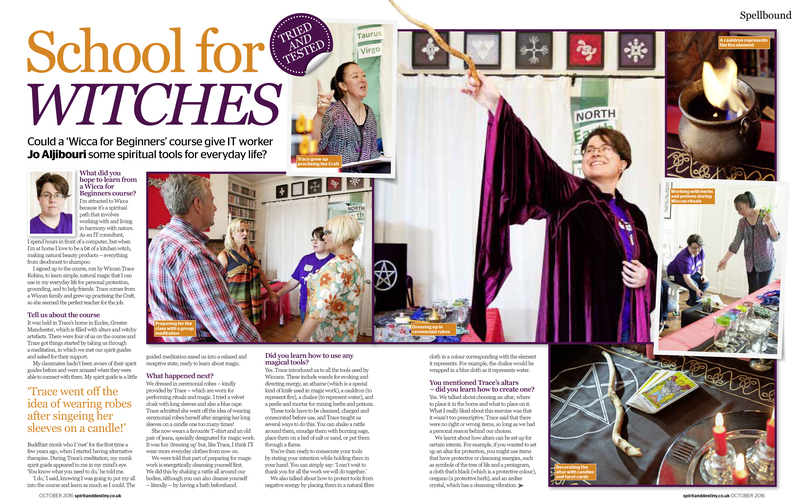 Each module explores different topics and themes that are involved in the practice of Wicca and magick from the basics of understanding the Elements, through to writing spells and spell casting. This course is a great fun way to learn with like-minded individuals. Each student is given a comprehensive colour workbook binder which is added to at each module. This workbook can then form the basis of your own personal Book of Shadows or Grimoire. Please note, modules must be done in order and can’t be pick and mixed. For example, if you do module 1 & 2 but can’t make 3, you would not be able to proceed to module 4 until you have completed module 3 with the next available group. Witchy 101 starts at the very beginning with the basics of Wicca and the craft and builds from there. This module allows students to view and hold many wiccan tools. Witchy 102 adds further layers and offers the students the unique experience of accessing one of their Wiccan past lives and exploring several of its significant events. Witchy 103 delves even deeper and allows students the opportunity to meet their spirit guide and spirit helpers. This is a truely overwhelming, wonderful experience for all involved. Witchy 104 adds even more layers of information and through the use of hypnotherapy, students are able to tune into and learn their true magickal names. Witchy 105 is a very practical module where students actually make and produce many of the products that they will use in preparation of performing a ritual. School for Witches also provides Curse Removal Sessions. These can be done over skype and are a great way to talk through and ascertain if a curse has been cast. A removal manual along with all of the tools required are provided as part of this session. 45-minute skype consultation along with manual and products £60.00. Please contact us to arrange a session. School for witches has put together some great value subscription boxes along with some one-off boxes on various witchy topics. Check the subscription tab to explore further. Copyright 2019 - School for Witches.